Kevin Harvick put on a driving clinic in Saturday’s Rinnai 250 at Atlanta Motor Speedway. The driver of the No. 98 Ford dominated the action on the track, leading 141-of-163 laps and winning both stages before taking the checkered flag 4.183 seconds ahead of runner-up Joey Logano. 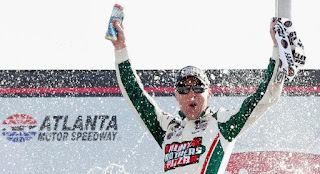 Harvick collected his fifth NASCAR XFINITY Series victory at Atlanta and the 47th of his career. He has won four of the last six events at the 1.54-mile track, where he also has won for four different car owners, tying Tony Stewart for the distinction of winning for four different owners at a single track. Atlanta continues to be a special track for Harvick, who earned his first Monster Energy NASCAR Cup Series victory here in 2001, after succeeding the late Dale Earnhardt in the Intimidator’s vaunted Richard Childress racing ride. “It’s just been a really good place for me, obviously getting my first Cup win here,” Harvick said. “We’ve run good cars throughout the years, and the race track has stayed very similar to what it’s been for a number of years. Harvick’s pit crew got into the act, too, pulling off a stop in 14.4 seconds under NASCAR’s new rules that have reduced the size of the over-the-wall crew to five members. That same crew pits Harvick’s No. 4 Stewart-Haas Racing Cup car on Sundays. “The good thing is they’ve had a lot of reps,” Harvick said. “We’ve had Clash reps, reps in the qualifying race, the Daytona 500, and they pitted on Saturday last week. They pitted on Saturday this week, and they’re just doing a really good job. Behind Harvick and Logano, pole winner Christopher Bell ran third, followed by John Hunter Nemechek, who scored a fourth-place finish in his NASCAR XFINITY Series debut. Elliott Sadler (fifth), Justin Allgaier (sixth) and Austin Cindric (seventh) were the only other drivers on the lead lap when Harvick crossed the stripe for the last time. Nemechek ran into early trouble on the bottom of the track and early trouble on the top. On Lap 7, Harvick bulled his way past Nemechek, who had just taken over third place. Nemechek’s No. 42 Chevrolet turned sideways after the contact, but he managed to save the car off Turn 4. Three laps later, Cole Custer cut to the inside of Nemechek in a battle for fifth as the cars entered the tri-oval. Nemechek slid to the top of the track, right into the path of Elliott Sadler, who had exited Turn 4 with enormous momentum. A tap from Sadler turned Nemechek’s car into the No. 00 Ford of Custer, who nosed into the outside wall and damaged his machine beyond repair. “It looks like the 42 got out of shape, and then the 1 (Sadler) had a run, and he didn’t hit the brakes hard enough and he hit the 42, and the 42 hit me,” Custer said after viewing the replay. Note: The No. 42 (of John Hunter Nemechek, finished in fourth) and the No. 52 (of David Starr, finished in 28th) each had one loose lug nut found during post-race inspection. Any potential penalties will be announced later.